I am a big fan of finding non-standard, creative solutions to typical problems that can easily be solved with a bit of cash. For example, one of my house projects included hanging large drawings with plexiglass. 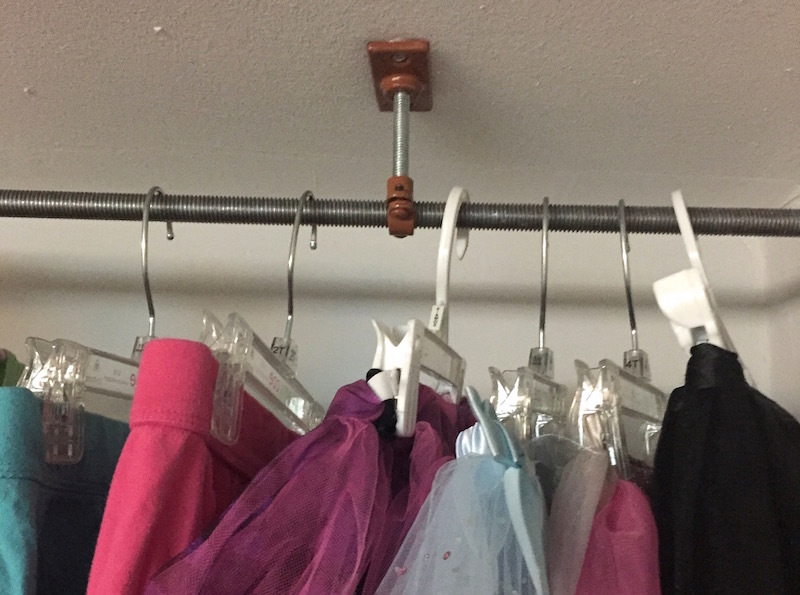 Having recently moved I needed a hanging rod for a small loft space attached to the ceiling (the width of the space is unusual and standard rod sizes don’t fit). The loft height is 6 ft., so I also wanted something thin and giving the place a bit of character. Here’s what I came up with. 2x3/8 in. Coated Ceiling Plate, $1.62 ea. 2x5/8 in. Split Ring Tubing Hanger, $1.61 ea. 2xToggle-Lock 100 lb. 2-1/2 in. Phillips Zinc-Plated Alloy Flat-Head Self-Drilling Drywall Anchors (2-Pack), $2.74 ea. Industrial-Looking Hanging Rod was published on May 22, 2015 .